As I continue to learn English, the most difficult part is not vocabulary (indeed, even today I have a very small vocabulary). Neither is it listening, speaking, reading or writing (which can all be mastered with lots of practice). The problem, to me, has always been grammar. Nouns and pronouns look simple, but what about compound nouns, indefinite pronouns, demonstrative pronouns and reflexive pronouns? Adjectives, adverbs and verbs should be easy, but the grammatical rules contain so many exceptions that they drive me nuts. (Shouldn’t “exceptions” become “rules” themselves when they occur way too often?) And don’t you dare mention those conjunctions and prepositions – each of them is so unique that one small mistake is enough to completely alter the meaning of the whole sentence. All of the above is why I particularly like the book Thinking in English: For Chinese Learners of English, which was recently published as a Chinese ebook. Written as a companion to high school and university English textbooks, it contains plenty of definitions, examples and exercises that encourage Chinese learners to think in English, instead of relying on their familiar Chinese grammar to learn English. Indeed, there are significant differences between English and Chinese grammars. As author Justus Nnakwe explains, adjusting or even twisting Chinese grammar in order to study English grammar will only lead to disaster. A simple example is the command “Come with me”. When one tries to consider it using Chinese grammar, it easily turns into “With me come” because Chinese language considers “with” as a verb and “come” as a direction. More importantly, in Chinese, one can easily say “With me come” or “With me go”, which practically mean the same thing, i.e. the speaker wants the listener to follow him/her to some place. However, in English, it is unthinkable for someone to say something like “Go with me”. As a result, the only solution for Chinese learners to solve the problems of studying English grammar is to completely abandon their Chinese grammar. Instead, when studying English, they should think directly in English, and “Come with me” is simply “Come with me”. Thinking or trying to fumble with “With me come” will only cause confusion. Which is why Thinking in English: For Chinese Learners of English is nicely different from other English textbooks. 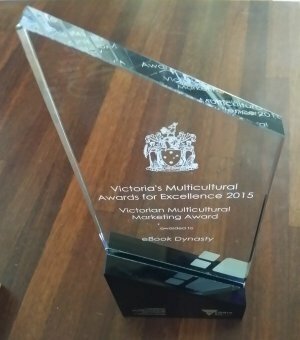 The author is not afraid to use English simply because his readers are Chinese. Instead, throughout the book, he encourages Chinese learners to consider the prominent differences between English and Chinese grammars. Once Chinese learners can appreciate the fact that these two are like chalk and cheese, not to be interchanged or intermingled, then they are more likely to rid themselves of the unconscious attempt to depend on Chinese grammar while studying English grammar. 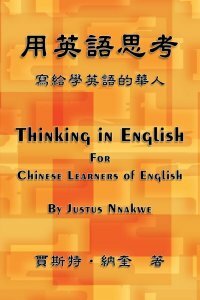 As a bilingual writer, I strongly recommend Justus Nnakwe’s Thinking in English: For Chinese Learners of English. If you want to learn English, then you shouldn’t be afraid of thinking in English.